Systems Architecture 6 Edition Systems Architecture, Sixth Edition, is the most comprehensive introduction to information systems hardware and software in business. 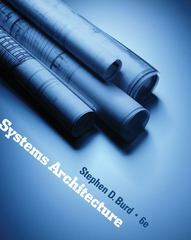 This new edition remains an indispensable tool for IS students, emphasizing a managerial, broad systems perspective for a holistic approach to systems architecture. Each chapter has been updated thoroughly to reflect the changing nature of new technologies, and all end-of-chapter material has been enhanced and expanded.